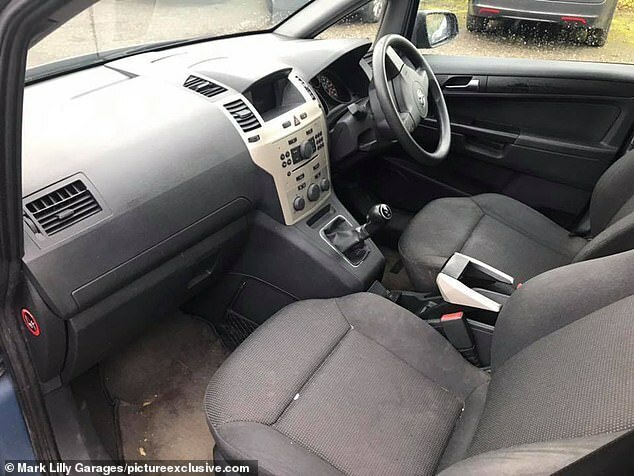 A used car dealership has put a 'disgusting' car up for sale on eBay after failing to shift it at their premises. 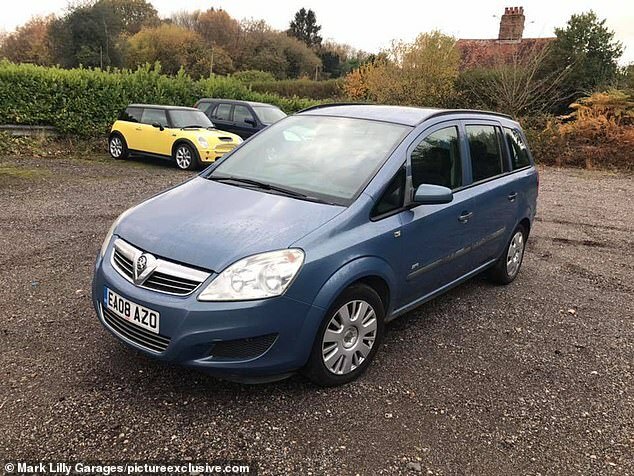 Mark Lilly Garages, based in East Sussex, took the seven-seater 2008 Vauxhall Zafira in part exchange from its previous owner along with £300 but quickly realised it had a litany of issues including oil leaks, misfiring and dirty seats. 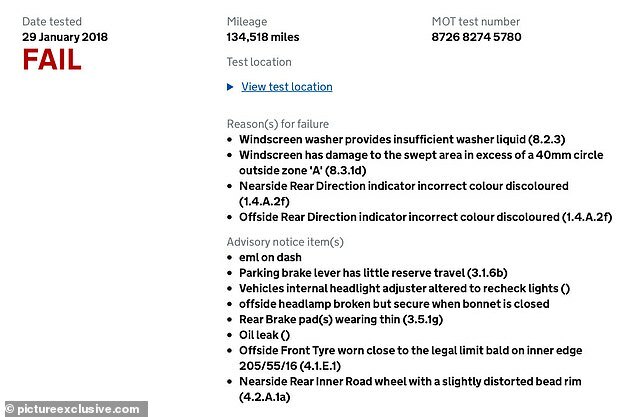 Now they have put it on the online auction site alongside an extremely honest description of all its faults, even going so far to urge people 'not to buy' the vehicle. But there has been a lot of interest and so far the bidding is up to £351, meaning they would make a small profit. Among its problems include broken central locking, worn tyres, a loose headlight and a radio stuck on BBC Radio 2. Sales executive Dan Hack said the only way they would get money for it would be to 'do something fun' with the advert, after deciding spending any cash on trying to improve the car would be a 'waste of money and a sin'. He also suggested it be bought for use in 'banger racing', where scrap vehicles are run around a track, or even turned into a garden feature. 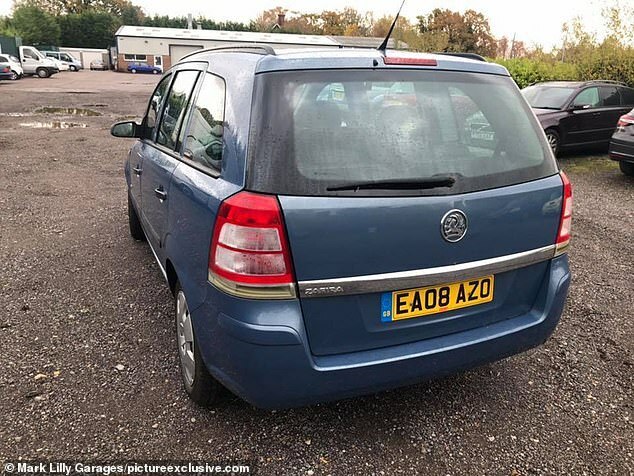 Mr Hack said: ‘It's one of the worst cars we’ve had in part exchange. ‘I thought I was going to lose money on it so thought I’d better do something funny with the advert, to hopefully get more people to see it and have had lots of messages from people saying how funny it is. 'I was expecting to lose money on it, so I'm very happy it's selling for more than the £300. 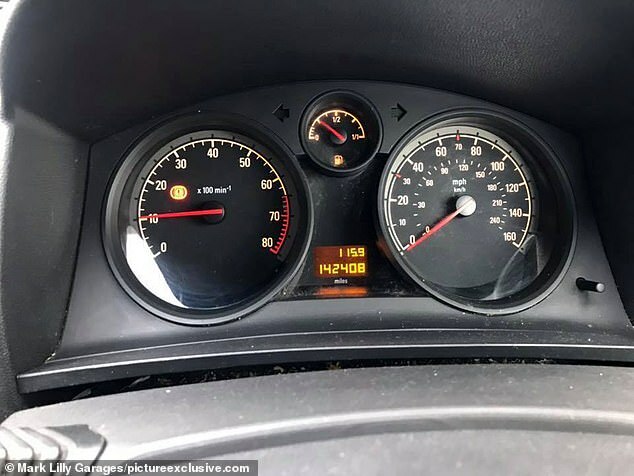 Mr Hack added the vehicle, which has done 142,000 miles, has failed its MOT every year for the past six years despite only being 10 years old. The auction ends at just before 1.55pm on November 16 and the buyer is asked to arrange collection or delivery - but is warned against trying to drive it home. 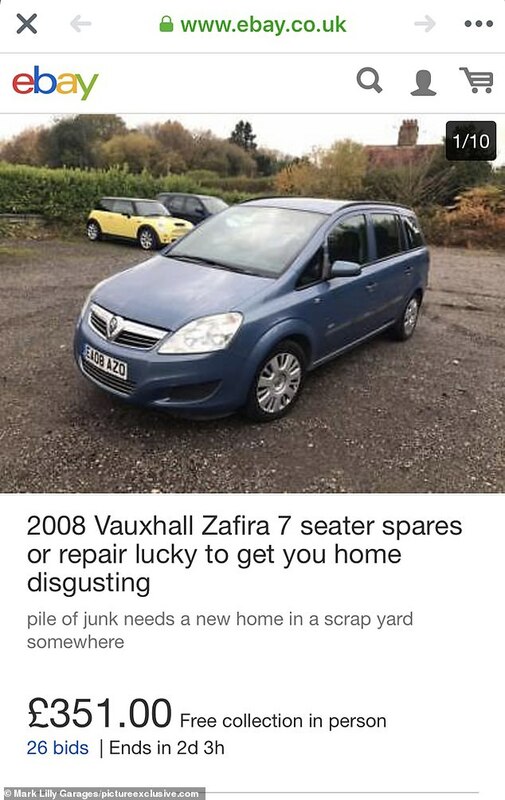 In the advert, Mr Hack wrote: 'I normally start my listings with welcome, on this occasion i'm not going to, not because i am not being polite but merely due to the fact that when you collect this car chances are politeness won't cut it! 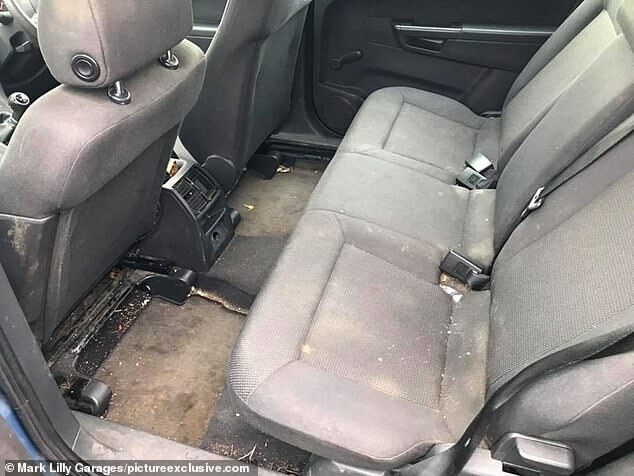 'In fact, I urge you not to buy it, I wouldn't, but sadly I have and its now my job to try and persuade you what a good car it is so you part with your hard-earned dosh to relieve us of this burden we have in the back of our yard, which is not only making our forecourt look untidy but also the weeds and trees around where it is currently abandoned. 'Where to start? It drove in well in part-exchange from the last owner a few days ago and since they brought it in its started to misfire. 'We haven't looked at it as spending any more money than the £300 we have spent taking it in would be a crime, a waste of money and a sin on our part. 'Engine and gearbox, well on the plus side this car does start, it does run and it does drive and the clutch and gearbox feel ok, the engine top cover has an oil leak which may be causing the misfire in the plug wells who knows. 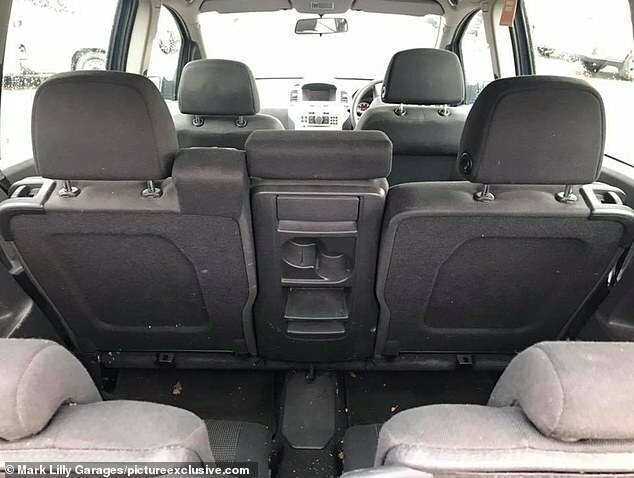 What is wrong with the Zafira? 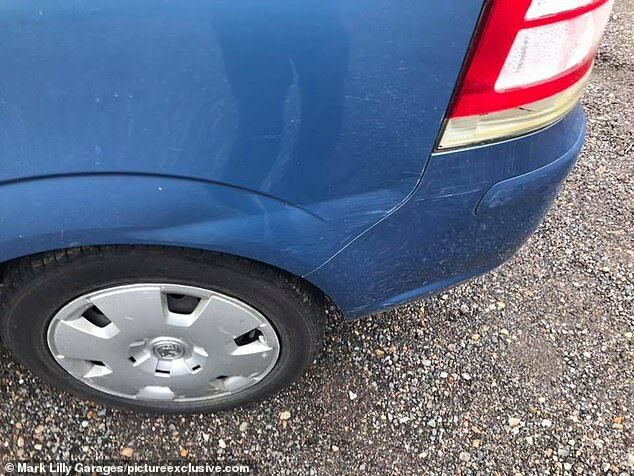 Mr Hatch even joked the presenters of popular television show Wheeler Dealers, which features old and damaged vehicles being repaired, would refuse the car. He wrote: 'If Mike Brewer bought this car back for Edd China to fix up you can just imagine Edd China's face, he would be shaking his head asking Mike what has he done. 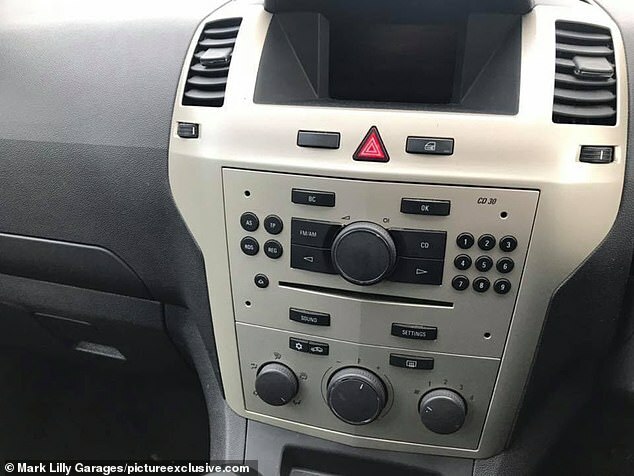 'If you're in to magic this car is perfect for you! You can cast a spell on it and make it disappear, alternatively you could cut the roof off it, fill it with mud and make a nice rockery with plants out of it in your back garden. 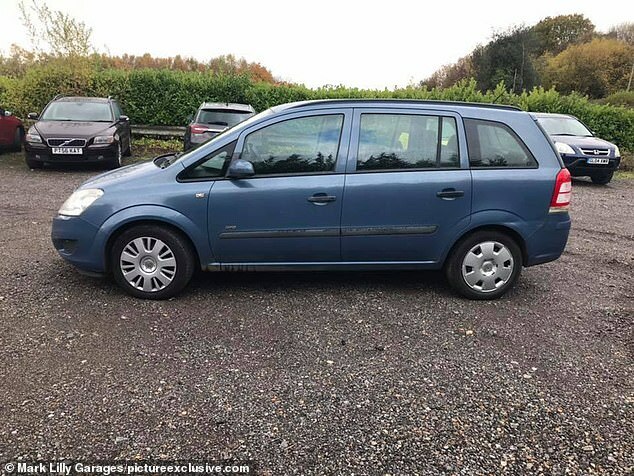 'Should you have any more suggestions as to what this Zafira can be used for send them through to me and I'll post them up under the description. 'Will it get me home I hear you say? I honestly can't answer that for the simple fact that chances are you will hold me to it and I don't want to be held responsible. 'BANGER RACING! Yes that's a good idea you don't need 4 (sic) cylinders for banger racing 3 will do that's a good use for it (sic), take it apart sell the spares and have some fun deliberately crashing into other people (on the track of course) but be careful they have been known to catch fire for no apparent reason. 'The central locking doesn't work but does it really matter? Who's going to steal it? 'It's dented along the nearside rear quarter, the radio doesn't light up but comes on so I'm afraid your stuck with radio 2. 'Service history wise its got a lovely 4 (sic) stamps in 10 years and 142,000 miles so for four years of its life its been very well maintained, a mixture of Kwick Fit (sic), and Halfords Autocentre, need i say more. 'On a serious note It would be a great car to take all your stuff to the tip. I don't quite know how you would get it in the skip though, they are quite high up and I think you would have to drain the fluids first. 'In the folder there are various breakdown invoices, diagnostic sheets and repair information. 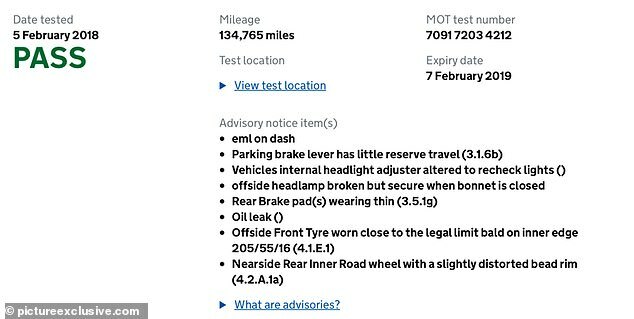 'On top of these if you look at the MOT history year-on-year the list of advisories just keep getting longer, some from previous years were even marked as dangerous! 'On that note i would definitely organise transport to pick it up, unless you think of yourself as Dangeorus Brian from back in the 90's. Remember him? If not you're probably too young, google Brian Conley or "dangerous brian"
'Luckily it has no outstanding recalls so chances of catching fire are slim unless you instigate the flames yourself. Mr Hack said the dealership will accept bank transfers and KESH mobile payment and again warned any buyer against driving their children in the vehicle. The advert added: 'Good luck and don't all rush at once to put your bids in give the system chance so not to crash it. 'It owes us £300 so I would like to think it would make that but running the risk of it not selling and spending more on it in listing fees, I was going to start at £100 but then I thought "What if it didn't make that, i would still own it?" 'So I've made it £1 to be sure that it will sell! Any questions please ask and must be collected really as soon as auction ends or a few days after at best as its making the place look untidy.